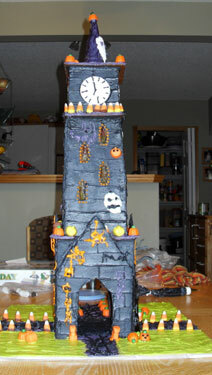 Money Back Guarantee This fun gingerbread clock tower template can be used to make a spooky, haunted tower for Halloween or a beautiful classic clock tower centerpiece. Decorate it for Christmas as you might see in the center of a quaint town. Made by another site visitor - Please send us your name if you see this! The inspiration for this Clock Tower Pattern, the Machynlleth Clock Tower in Powys, Wales. 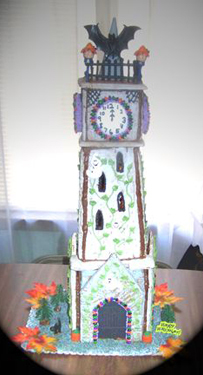 To use your gingerbread clock tower pattern, you simply print the .pdf file (we suggest printing the pattern pages on thick, card stock paper, but regular is fine too), cut the pattern pieces out of paper, lay them on your rolled out gingerbread, cut along the lines, bake, assemble, and decorate. Don't forget to take pictures along the way! This pattern builds a house that is roughly 6"W x 6"D x 23"H but you can enlarge or shrink the house by adjusting your printer settings. Click here to see more gingerbread house patterns. Return Home from gingerbread clock tower template page.